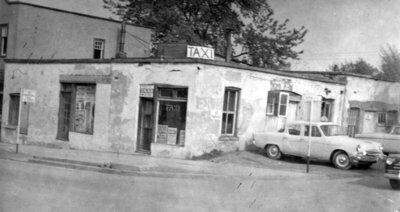 A black and white photograph of 117 Dundas Street West. The Harris block was one of Whitby's slums for many years and residents had to be evicted from it. It was demolished in June and July, 1956. It has remained a vacant lot where taxis park, ever since. 117 Dundas Street West, 1956, The Whitby Weekly News. Whitby Archives 01-000-403.